Celebrate something new this year. While Christmas may have begun solely as a Christian holiday, and is often still celebrated as such, people from all over the world have embraced the festive season and added their own traditions along the way. Manger scenes, Santa Claus, and smiley snowmen still reign supreme, but if you look hard enough you will discover some very different takes on December's most famous day. 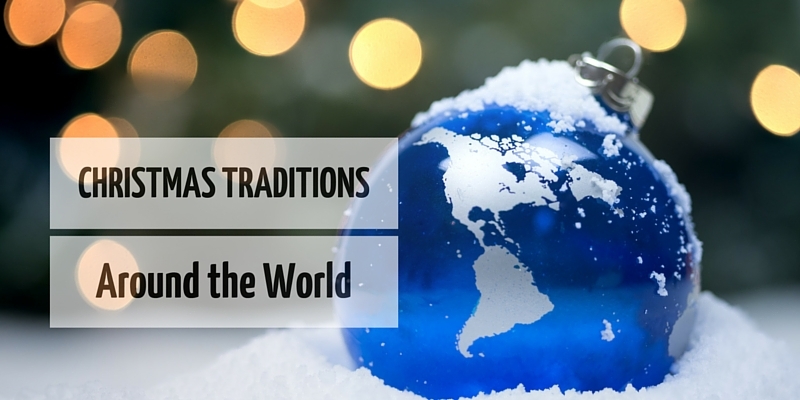 These are the most unusual Christmas traditions around the world. British kids are well acquainted with Father Christmas, Santa Claus or Saint Nick, but they can consider themselves lucky they don't live in Austria, where a ghoulish creature called 'Krampus'; the evil accomplice of St Nicholas, is said to wander the streets in search of badly-behaved children. During the month of December you can expect to see terrifying masked figures out and about scaring kids and adults alike with ghastly pranks. If this holiday tradition sounds like your kind of thing, be sure to check out the annual Krampus parade in Vienna. In the Venezuelan capital of Caracas, swathes of city dwellers make their way to mass on roller skates every year on Christmas morning. The tradition is now so well-established that many of the city's streets are closed to traffic from 8am on the day, so that the skating congregation can get to church safely. It's even said that children will sleep with one lace from their skates tied around their toe, the other skate dangling from the window so that their friends can wake them up with a friendly tug on the lace. One of the weirdest festive traditions we've heard of comes from Iceland, where a giant cat is said to roam the snowy countryside at Christmas time. Traditionally farmers would use the Yule Cat as an incentive for their workers - those who worked hard would receive a new set of clothes, but those who didn't would be devoured by the gigantic cat-like beast. Today it is customary for everyone in Iceland to get new clothing for Christmas to avoid an unsavoury demise. Ukraine's strangest festive tradition is not one for arachnophobes! Where we would have baubles, tinsel and stars, Ukrainians use decorations that mimic the natural formation of spiders' webs shimmering with dew. The tradition goes back to a folktale about a poor widow who could not afford to decorate a tree for her children. Legend has it that spiders in the house took pity on the family's plight, and spun beautiful webs all over the tree, which the children awoke to find on Christmas morning. Spiders' webs are also considered to be lucky in Ukrainian culture. Back in 1974, the American fast-food restaurant KFC released a festive marketing campaign in Japan. The seemingly simple slogan "Kurisumasu ni wa kentakkii!" (Kentucky for Christmas!) spawned a national tradition that still thrives to this day. Although Christmas is not even a national holiday in Japan, families from all over the country head to their local KFC for a special Christmas Eve meal. While fried chicken it may be, expect to pay a higher premium on the biggest sales day of the year. A KFC Christmas dinner clocks in at around 3,336 yen (£20). Image by Jamie Anderson under Creative Commons license. The Christmas tree tradition embraced around the world today is believed to have started in Germany back in the 16th Century, so it comes as no surprise that our Teutonic cousins still have some funny customs relating to the festive trees. One of these is to hide a pickle somewhere within the branches of the tree, and give a gift to whichever child in the household finds it. Some claim that the tradition may not be German after-all. One legend says that the Christmas pickle originated in Spain when two young boys were held as prisoners inside a pickle barrel. Saint Nicholas rescued the boys and brought them back to life. Either way, a pickle on the Christmas tree is a tradition we can totally get behind. Many homes in Finland come equipped with their own sauna, and at Christmas time this cosy spot becomes a sacred space associated with long dead ancestors. On Christmas Eve, it's customary to strip naked and take a long and respectful stint in the sauna, which is also believed to be home to the legendary sauna 'elf'. After the sauna session, Finns head out to the evening celebrations - while spirits of those ancestors take their place. Every year in in the days leading up to December 5th, Dutch children eagerly place their shoes by the fire in hopes that Sinterklaas will fill them with small gifts and treats in the night. Traditionally, carrots are left in the shoes for the companion of Sinterklaas, a white horse named Amerigo. In the olden days, naughty children would receive a potato in lieu of gifts, but potato punishment is no longer considered an appropriate scare tactic. Forget Santa and December 25th when in Italy, as all the action takes places on the eve of January 5th. According to folklore, an old woman named Belfana visits all the children of Italy to fill their stockings with candy and leave them presents if they've been good. Just like Father Christmas, Belfana enters through the chimney and is left treats by the children who live there - typically wine and local delicacies. When you think of Christmas food, minced pie and turkey are often high on the list. In South Africa, however, it's the creepy crawlies that local children look forward to. Fried caterpillars on Christmas may seem like one of the weirdest Christmas traditions around the world, but these caterpillars aren't just the run-of-the-mill variety you find in the garden. The Pine Tree Emperor Moth, or Christmas caterpillar, is covered in very festive hues - giving all who swallow a little extra luck in the coming year. According to Norwegian folklore, Christmas Eve is the day when mischievous spirits and witches take to the skies for mischief and general tomfoolery. As witches often use brooms as their preferred mode of transportation, it is tradition for Norwegian families to hide any cleaning supplies attached to sticks where the witches won't be able to find them. The video above is a 1958 Christmas special called "Kalle Anka och hans vänner önskar God Jul" or "Donald Duck and his friends wish you a Merry Christmas". Every Christmas, families around Sweden gather around the television at 3pm sharp, to watch Donald Duck. Everything on Christmas is planned around the television special, and more than 40% of Sweden's population still tune-in like clockwork. The tradition dates back to the 1960's when televisions were a new commodity in Sweden and only two channels aired - one of which played Disney cartoons at Christmas. It may be a quirky tradition, but a whole nation coming together to watch Christmas cartoons together is about as Christmas as it gets. Thought all Christmas trees were created equal? Think again. The Kiwis are all about the pohutukawa, a beautiful tree that is native to New Zealand with gnarled roots, and bright crimson flowers. The first mention of the pohutukawa tree came from Austrian geologist Ferdinand von Hochstetter in 1867. He described locals decorating their churches and homes with the brightly coloured branches on Christmas. Today the pohutukawa tree is a recognised symbol of Christmas around New Zealand and is featured on Christmas cards, decorations, and even in the Christmas carols that children sing at school. Easily the most outlandish Christmas tradition on this list, meet Tió de Nadal, the Christmas log. Tió de Nadal is made from a hollow log, with stick legs, a smile, and a red hat. Every evening between December 8th and Christmas Eve, the children feed the log small treats with water, and leave him under a blanket to keep him warm. On Christmas Eve, things get weird. Children are tasked with beating the log with sticks while singing traditional songs which include amazing lyrics such as "Poop log, Poop nougats, Hazelnuts and mato cheese, If you don't poop well, I'll hit you with a stick, Poop log!". After Tió de Nadal is properly beaten and serenaded, the log magically poops out presents and candy - where he is then considered useless and thrown in the fire for warmth. Last but not least, we have one more Christmas tradition from Sweden - which may just be the oldest tradition still celebrated on the list. The Yule Goat dates back to at least the 11th century where there are mentions of a man-sized goat figure, led by Saint Nicholas, who had the power to control the devil. The Yule Goat, as you can imagine, has changed quite a bit throughout history. In the 17th century, it was popular for young men to dress as the goat creature and run around pulling pranks and demanding gifts. By the 19th century, the goat became the good guy - a giver of gifts. Instead of Father Christmas, men in the family would dress up as the goat and give gifts to the entire family. Today, the man-goat is no longer and the Yule Goat has taken its place in modern history as a traditional Christmas ornament on trees throughout Sweden. In the larger cities, giant versions of these goat ornaments are created out of straw and red ribbons. As you may have anticipated, a giant creature made out of straw is easy prey for pranksters with fire, and many yule goats meets their demise each year. Did we miss one of your favourite Christmas traditions around the world? Let us know in the comments so we can add it the post! Written by Abi Silvester, a London-based writer and editor with a passion for great food, fine wine, coffee and cats; always planning my next trip! Follow her on Twitter.